laser printers.Ideal for all modern office equipment. Rated a very high 88 brightness. 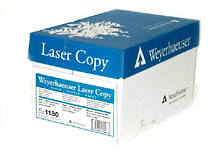 Laser Copy will make your letterhead and other important documents look great. Stocked Sizes: 8.5 x 11-20lb., 8.5 x 14-20lb., 11x17-20lb., 8.5 x 11-3 hole Punched 20lb.